Born Knox County, Ohio USA 29 May 1906. Attended Yale University and lived for many years in England. 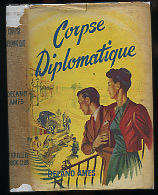 Wrote 20 crime-mystery novels between 1932 and 1967. 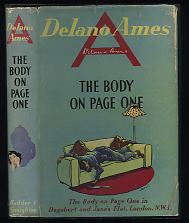 Delano Ames published before the war some six or seven books, ranging from yarns about the Secret Service to a philosophical novel about the Greek Gods—and, of course, a psychological study of adolescence! He had two plays produced at West End theatres, a third televised and a fourth stopped by the Lord Chamberlain. The war put an end to this feverish activity and, startlingly transformed, he became a major in the army, and landed at dawn one historical morning on a beach near Algiers. It was Sunday and the beach was lined with small children in their best clothes, clapping their hands, waving tiny French, British and American flags and crying : " Vive Churchill! " This was the invasion of North Africa. About a year later his wife forwarded his calling-up papers, which he received in the first post to arrive after the Salerno landings! He finished his war career in an office in London. Faced with the rigours of peace and the necessity of supporting a charming wife, he turned down a regular job which involved attending an office from nine to six and instead translated an erudite history of keyboard musical instruments from the French. This sold at least a hundred copies. He withdrew to a village in Somerset, and wrote SHE SHALL HAVE MURDER. This sold more, and when he had recovered his poise he packed his typewriter and his wife's trunks and went to Mexico, where the criminal adventures of Jane and Dagobert continued. A little later he had a poste restante address in the south of France before returning to London. He believes that all novels are essentially mystery novels, that the most interesting -thing about people is the reason for their behaviour—their motives^ their alibis, the sometimes conflicting and often hidden passions which make them act as they do. The novelist's job is to unmask his characters, to seize like a detective upon those clues which will betray them into betraying themselves. All human relationships are a puzzle, and all stories about human relationships are an attempt to solve the puzzle, to unravel the mystery.